Foreo has become an integral part of my skincare routine thanks to the Luna Mini. Now, they've also become part of my oral care routine with their toothbrush, Issa. The Issa incorporates the same versatile technology as the Luna line, but within a gentle, silicone toothbrush. How To | As with the Luna devices, the Issa comes with a charging cord. Simply plug it in for about an hour until the light stops blinking and it's fully charged and ready to go. One charge lasts up to 365 uses so there's no need for daily charging. Just add toothpaste, turn it on, and use it as you would a typical toothbrush. You can increase or decrease the intensity of the pulsations with the + or - buttons. When done, just turn off the Issa and rinse it completely. Design | The Issa is made with non porous silicone. This material holds 10,000x less bacteria than a toothbrush with with bristles. This makes it much more sanitary than your everyday toothbrush. The brush head is removable so when it is time to replace it in a year, you can switch it out for a new one. *Replacement brush heads sold separately. Overall | I found the Issa to be quite an adjustment to use after using typical disposable toothbrushes. It feels very gentle and less abrasive than regular bristles. However, my teeth still got just as clean, if not more so than with a typical toothbrush. They looked more shiny and polished after using the Issa which I love. I also love the idea of using a more sanitary toothbrush. It's much more appealing after learning how much less bacteria is held on the silicone brush! 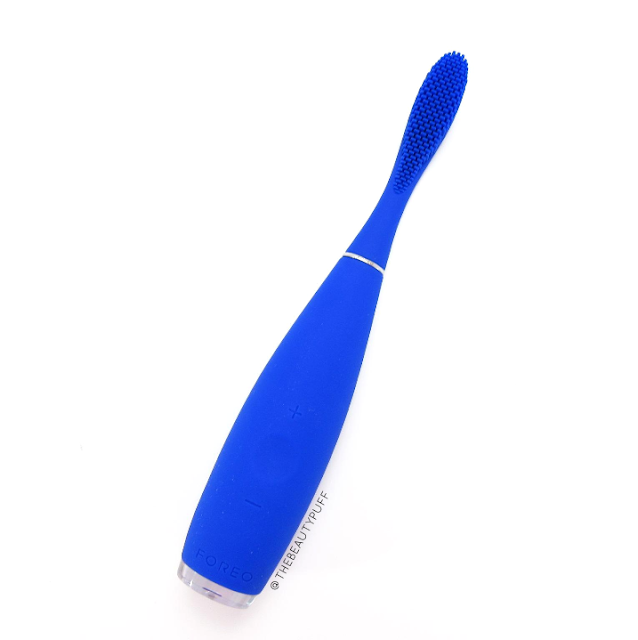 The Foreo Issa comes in Cobalt (pictured), Mint, Lavender, and Black. Shop the entire Foreo Oral Care collection below!